Signature building behind the development team of Living Shangri-La, Fairmont Pacific Rim & Vancouver House. Westbank "Telus Garden" Offers a rare opportunity to own in Downtown's most Desirable High Rise. 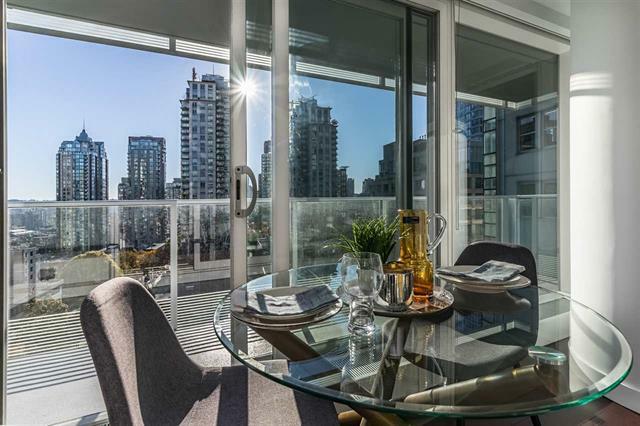 Gorgeous South West Facing Corner unit comes with a 200Sqft Wrap around balcony showcasing amaing sunsets & Downtown Vancouver City views. Stylish gourmet kitchen features Quartz countertops, miele appliances w/ entertainment sized living customized in bamboo hardwood flooring, floor ceiling windowns & ample sized bedrooms.. You'll love the Energy Efficient heat/cool system, private den off entry & one of a kind amenities. 24hr Conceirge, fitness/yoga room, lounge patio, outdoor heated pool, hot tub & pet friendly elevated dog park. Includes 1 Parking/1 storage/2 bike storage.